As mentioned, Queen by all accounts looks and feels grand and beautifully produced. The sets are lavish and thoughtful, and the costume department is knocking it out of the park. 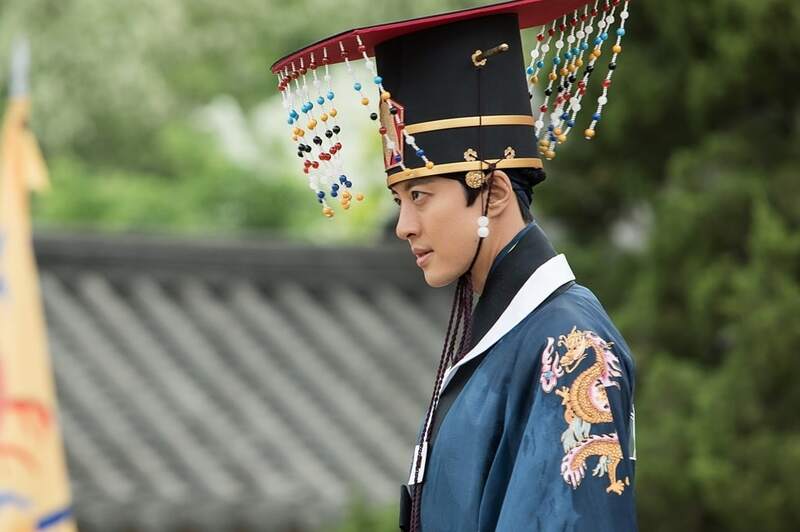 Normally I hardly pay sageuk garb any attention (there's only so many ways a robe can stand out), but the beautiful prints and wonderfully tailored pieces here are really notable. The plot, while not entirely perfect, flows easily and is engaging. It doesn't drag, and transitions smoothly between tragically grandeur moments to more relaxed rom-com scenes. The OST isn't all that noteworthy (and it relies overmuch on some rather simplistic instrumentals), but it's pretty and at least doesn't distract much from the story. In short, Queen has all of its groundwork laid-out and covered. However, my fundamental issue with this drama is that I don't feel at all invested in either of our two leads, Lee Yeok and Chae Kyung. I can only presume it's due to a combination of writing and acting. From the writing perspective, their romance feels entirely trite and convenient. I'm rarely a fan of the childhood lovers trope, and here I'm similarly lukewarm on it. It felt like we spent far too much time in the childhood stages, and all through the first four episodes I felt as if I was just biding time until the adults could finally take over. 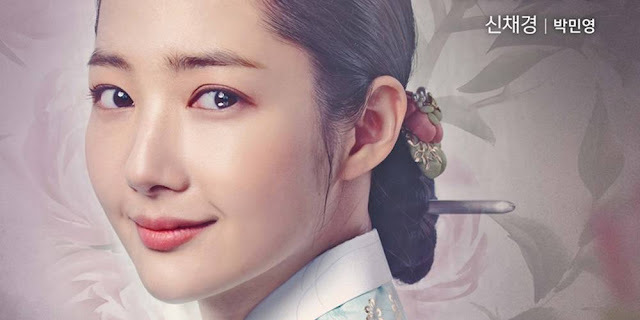 It wasn't that the childhood scenes were all that bad - they were fairly interesting and the acting was decent - but I had trouble connecting Park Min Young and Yeon Woo Jin with the youngsters that played their teenage counterparts. Don't even try to say they looked alike or shared the same mannerisms - at the end of the day, they are still very obviously different people, with different ways of speech and different behaviors. Thus, watching the two young ones fall in love just doesn't translate visually into watching the adult counterparts fall in love. Speaking of the childhood scenes, a lot of the love scenes frankly didn't resonate with me because the actors looked almost disturbingly young (certainly too young for this type of forever-love). It was only after doing a search that I found out that young Chae Kyung is actually 15 (seriously, she looks like a 10-year-old) and young Lee Yeok was 19 (so weird, he has such a baby face). I couldn't take their young gestures of love seriously, because honestly you don't really know anything about love at that age. Young Chae Kyung was also more than a little obnoxious - that accent and that high-pitched voice didn't exactly win me to her side. I have to say Park Min Young was a welcome relief from that. Now that we're in the adults stage, I'm still not onboard this train. Again, the romance seemed to come a little too easily and too predictably. There was no winning of feelings or slow growth in love, which is what I watch dramas to see. Instead, it was like one day as children they were suddenly in love and nothing could make them feel otherwise. I actually felt similarly about TPM's fast romance (seems like a sageuk thing), but in the latter I at least completely felt for the leads' love and dilemma especially post separation. Here, they weren't separated long enough or painfully enough for me to really care, and ultimately I'm just not won over to their fated pairing. 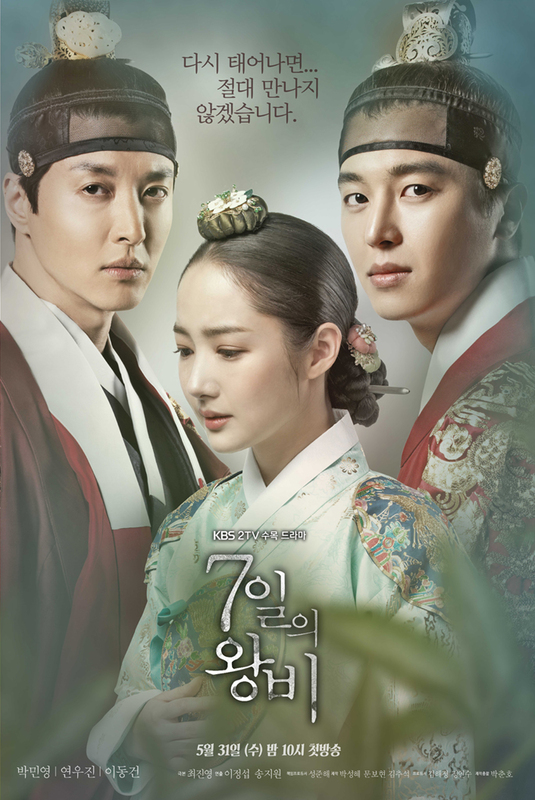 The portrayals may also have a role in my apathy - neither Park Min Young nor Yeon Woo Jin have ever fully won me over to their characters. With Park, I've seen all of her major dramas, but never fully bought into her leading ladies. It's odd because she gets such great characters that I would normally be all about. I think the issue for me is that her portrayals still feel a touch superficial, where you can see the seams of her acting rather than inhabiting a character. She cries easily and prettily, but ultimately I don't feel swept into her emotions, because I perceive it as a performance rather than a true expression of the emotion. It's a tough problem to solve, and it's a reason why I always get a bit disappointed when she gets cast in a meaty role over someone who may be able to take it further. Yeon Woo Jin is in a slightly different camp, in that I'm simply apathetic to him as an actor. With leading men, they just have to have a certain appeal in order to get your investment, and with him I just unfortunately don't feel much of anything when I see him on the screen. He's not awful, but he's also not great, and I don't feel much of a change in opinion from here versus the last project I watched with him, Marriage Not Dating. Even worse, I fundamentally don't like Yeok as a character, as my emotional investment is completely in Yeonsangun's camp and Yeok is his greatest rival in both love and the throne. Sure, Yeonsangun may not have stopped the assassination attempt against Yeok, but the latter is now more or less doing the same, only directly, against his brother via backhanded ways such as the snail wives. I understand that Yeok has his own legitimate motivations, but I just find myself apathetic to them and to him, and instead resentful that he'll ultimately win everything that Yeonsangun had. Yeok clearly has the upper-hand in everything here, as he has his mother, the girl, his friends, and ultimately the backers he needs to win the throne. The underdog supporter in me just feels like it's more than a little unfair, especially once you add in how bland I find him as a character. Combined together, you can see my dilemma in that the central couple, who we're meant to root entirely for, is built from two pieces that I could do without. And that makes a critical difference in one's general investment and interest in a drama. Luckily for this drama, they did an amazing job casting Lee Dong Gun with his conflicted and pained portrayal of Yeonsangun. Now here's a case of an actor I'd never previously cared about managing to get me completely hooked on his character, through good writing and acting. 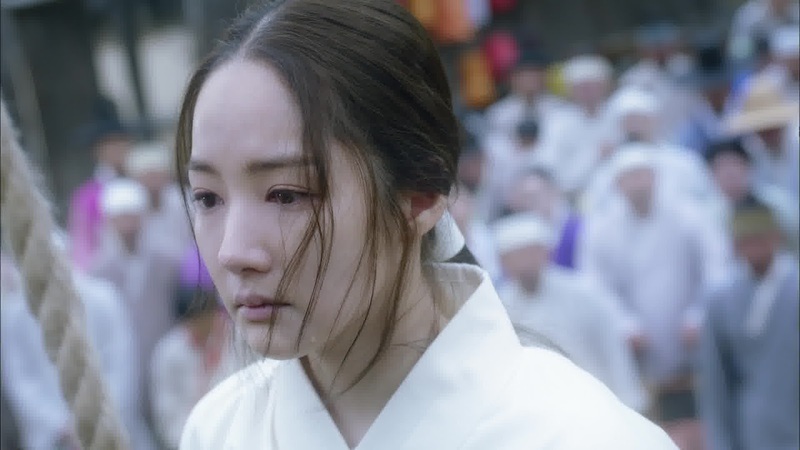 Yeonsangun is by far the most complex and interesting character in the area, with the type of darkness and intensity of feeling for the leading lady that just gets me in the heart. I know it's completely foolish to be watching this show for him, as his fate will likely be the most tragic and miserable of any, but urgh I can't help it. I know he won't get either the girl or his life, but gosh here's to hoping the writer feeds him crumbs of happiness along the way. Hopefully Chae Kyung won't make me straight up dislike her by betraying him and treating him cruelly. Yeonsangun as portrayed here is just such a fascinating mix of characteristics, which hooked me in starting from his early encounter with Chae Kyung by the stream. He's not a bad person, merely one who got the worst draw in both family and love. One can only imagine how different everyone's fates would be had Chae Kyung decided she loved him and advised him instead. To me, he is the real central player in this story, with Lee Yeok and Chae Kyung as the respective antagonist and failed love interest. I want him to be happy, but I also know that's likely not even close to feasible. I can see why the general audience may be staying away from this show, as it runs a tad too deep in the dark and depressing zone for most summer viewers. Even I'm thinking of dropping it, though mainly because I'm not sure my heart can handle more pain and madness being cast upon Yeonsangun. Similarly, if others are not that swept into the romance, then it becomes really tough to keep watching as all the light and happy moments are reserved for the central couple. The kiss that ended episode 10 made me feel a little conflicted, as it certainly wasn't meant to be either romantic or a step forward in the relationship between Yeonsangun and Chae Kyung, not the least hinted by the lack of zoom-in and the presence of Yeok in the background. On one hand, I'm happy that Yeonsangun at least clarified his emotions to Chae Kyung, because few things are as frustrating as someone keeping their feelings in the dark and allowing a misunderstanding to brew. It was truly such a mistake, though an inevitable one, for him to let her get engaged to his brother, because now he must deal with seeing her together and in love with his rival for the rest of his days. At the very least he should have sent them away, and I fear their obvious love and relationship will drive him further mad. If it's one thing this drama gets right, it's the portrayal of how destructive jealousy can be, especially in one who has been subject to it from his family his whole life. It totally makes his arc believable and tragic in such a human way. Some have mentioned how Yeonsangun (per this drama) was the writer of his own demise. I don't entirely agree with that view, because while some things, like his manic reactions, are within the realm of his control, many things here clearly are not. It's not clearly his fault that his ministers are motivated by their own greed, and that he's surrounded by poisonous and devious people like his primary secretary and Nok Soo. Perhaps he could get rid of them, but they are also clearly people who have been by his side for years and therefore people he can't simply throw away. Similarly, one can't blame him for being in love with Chae Kyung, yet having her be in love with his brother (of all the people, this is probably the worst in its impact on him). And of course his dad seemed like an insensitive and biased monster. He is entirely alone in the world, at least in his mind, and that's a very difficult place to break free from. I'm not excusing his cruelty or lunacy, but there is clearly a cause for his behavior and he's in a situation that anyone would find challenging. At the very least, I'll stay tuned for this week's episodes to see what the ramifications of that kiss will be. And then I'll hope that Lee Dong Gun gets another meaty lead role shortly thereafter.